After Yasiel Puig struck out to end Tuesday's game, benches cleared in Los Angeles as Puig appeared to take exception to the manner in which winning Washington celebrated the club's victory. Benches clear in "Loss Angeles." With two out and one on (R2) in the bottom of the 9th inning of the Nationals-Dodgers game, Dodgers batter Puig swung at and missed a 3-2 slider from Nationals pitcher Koda Glover, resulting in a game-ending strikeout and Nationals win, 2-1. After the strikeout, Puig expressed dissatisfaction at Glover's apparent celebration, resulting in a bench-clearing incident as Ted Barrett's crew of HP Umpire Angel Hernandez, 1B Umpire Chad Whitson, and 2B Umpire Lance Barksdale joined Barrett in separating the teams; no ejections resulted as the Dodgers and umpires left the field without further incident as the Nationals resumed their infield celebration. From past experience, we know that in Major League Baseball (unlike, for instance, the NBA), post-game ejections may result from misconduct that occurs after the final out, but while the umpires are still on the playing field. Dan Bellino delivers a post-game ejection. 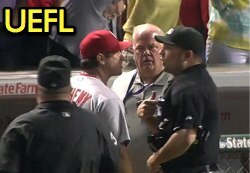 For instance, Dan Bellino ejected Cardinals Manager Mike Matheny on July 12, 2013 after the final out of that evening's Cards-Cubs game. Earlier that month, Tony Randazzo ejected Indians SS Mike Aviles for arguing a foul ball after his at-bat (and the game) had ended, but before Randazzo and Aviles had left the field. In September 2012, Mike Estabrook ejected Rays 1B Carlos Pena for arguing a strike three call that ended the Rangers-Rays game. The same is true for pre-game festivities: Jerry Layne ejected Chicago's Mark Parent, for instance, during the traditional umpires-coaches pre-game plate conference and lineup card exchange.